Tracking the process for creating the ancient and venerable flat bow; a complex hunting tool from five continents. This is a very brief overview of a process that takes many bows to master. Splitting the stave. 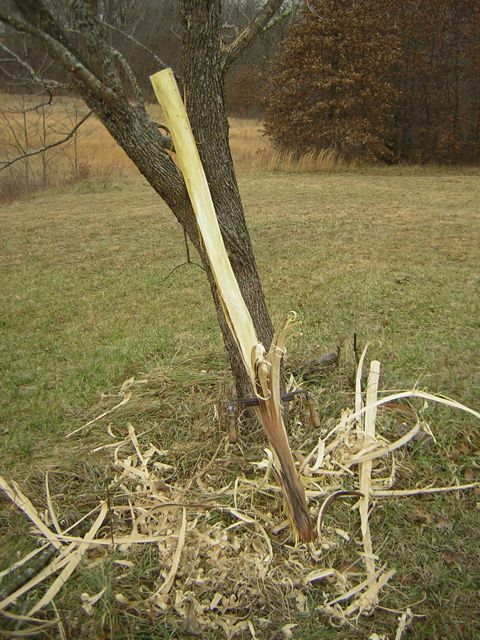 In this case, an Osage orange. I can honestly say that bow-making was my gateway skill into the primitive technology world. It’s one of the few things I believe I truly mastered. I became interested in this old technique while still a teenager and, though my interests have shifted to new things, I never really lost my passion for it. While I am currently writing a more extensive “how to” for bow-making, here is a visual step-by-step of the process, from the beginning. I have used some of these photos before so long-time blog followers may recognize them. Sometimes, splitting can be tough. 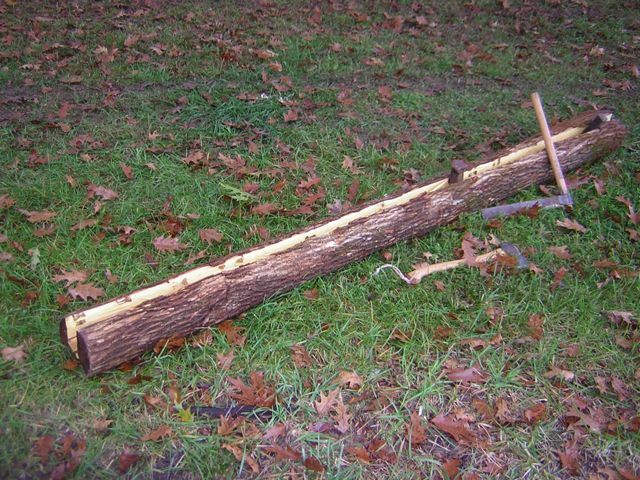 As can be seen in the photo above, I use an axe, froe, and hammer or maul. Not visible above here are short hickory wedges (hardwood limbs work nearly as well) that are jammed into the growing crack to keep the stave from snapping shut. Also not present is the wooden maul for striking the froe. The embarrassing presence of the framing hammer above is a case of “when in need, any tool can be the right tool.” I was in a hurry that day. 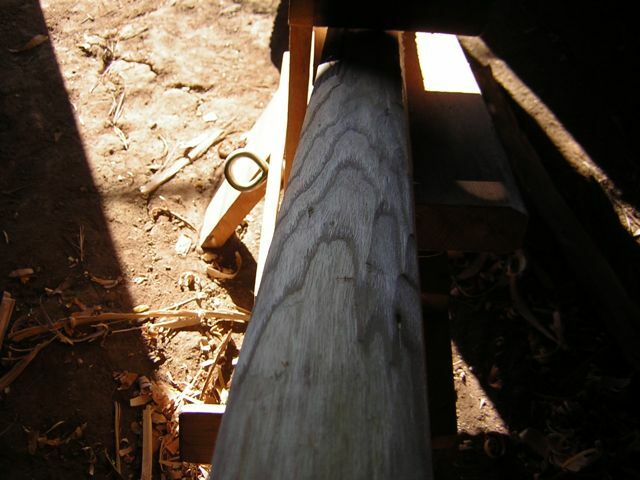 Debarking the stave with a drawknife and working the back down to a single, thick growth ring. Some species of white woods debark quite easily and the back of the bow can be the outermost growth ring. Not so with Osage Orange. The white new wood is visible in the stave above and should be removed. This part of the process is easiest with a sharp draw knife working downward. Your weight can be used to pull through the bark, relieving the arms and shoulders somewhat. Closing in on a single growth ring. 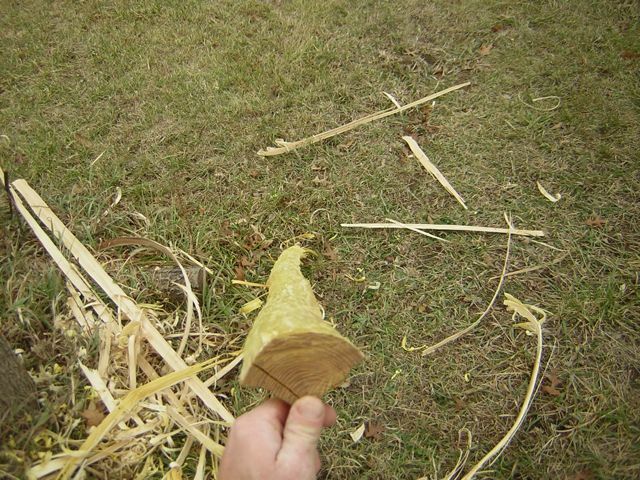 The above photo shows the back of the stave as the outer rings are removed. 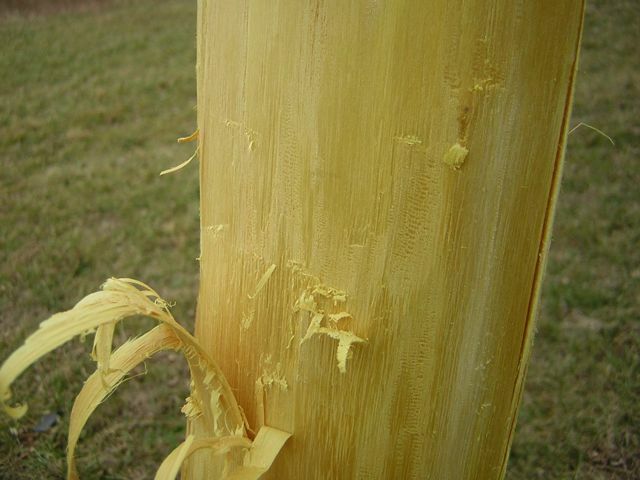 With Osage orange, there is a vesicular layer between hard wood rings. This is just visible here as the almost spongy-looking white wood. Extremely hard woods work well with sharp steel, leaving a slick, clean surface. Sighting down the nearly clean stave. Not perfectly straight, but then it wouldn’t be Osage otherwise. This is a different bow that shows the growth rings being removed. They are clearly visible in the low, raking light. The smooth area nearest the viewer is at the desired ring. 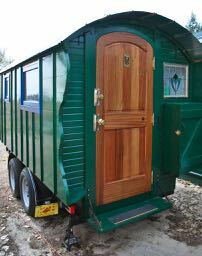 After the tedious work is completed on the back, it is simply a matter of marking out the shape, removing the excess wood, and tillering the limbs to the desired draw weight. I don’t generally stop long enough to take photos but here is a bow nearing completion. Note the fine Ozark barn decor. Above, I’m working the bow to its final shape prior to final tillering. 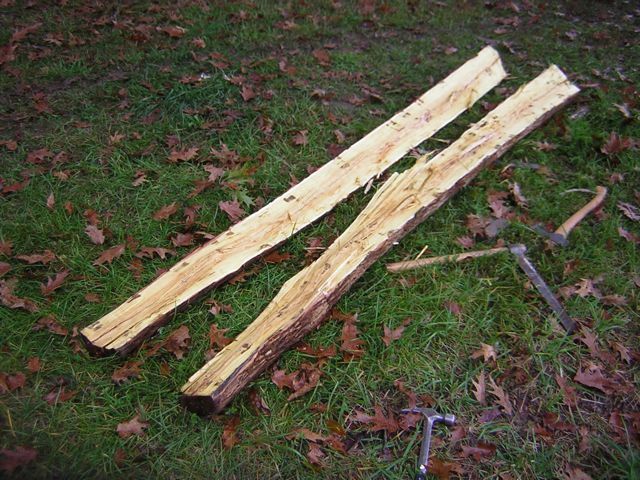 This is a shagbark hickory stave, not the one shown above. I’m not saying that this is easy per se but something that can be accomplished through perseverance, patience, and thoughtfulness. 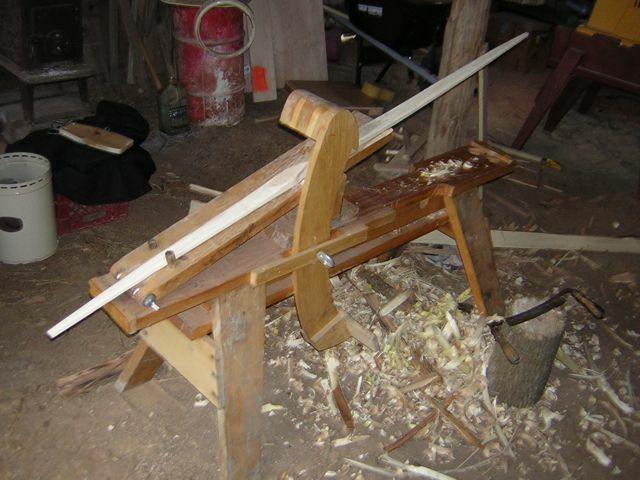 While there are no hard and fast rules to bow-making, there are some real guidelines and preferences that lead to success. If you hear someone tell you that this is the only way, then you may want to take that advice with a grain of salt. Look for more on bow-making in the near future. ← Cigar Box Guitar God? Thanks for sharing this, I really look forward to seeing more making bows! Really cool. Wow another great work ! I would like to make a bow similar to yours in the future. I already told you that you can’t make me learn! On that note, may be thinking that your devilish stick and string contraptions may have a few advantages….though obviously not anywhere near that of the tried and true stick and stick. Sometimes, a tribe member must be left behind. Or eaten during a particularly long winter. Well, haven’t quite acquired that much white in the beard yet….but getting the kit that small for a long wander is a damn fine goal….. I took some artistic license with the age. It won’t be long Jim. And that is a dream-sized kit. Helluva job George, fine work! Looking forward to more on bowyer craft, George. Got lots of hickory here. Thanks. The writing has taken a long time.